Dave Cromwell the Quality Lead at Office Smart Solutions (OSS) is about to create the first Receiving Inspection Plan for Office Smart Solutions (OSS). In the previous section, he had created a master copy or reference collection plan from the Template Receiving Inspection Plan. He would now use this reference or master plan. Dave copies the Master Plan into a new plan that he prefers to call – PO INSPECTION LH101 VER 01. Dave believes that if every item is going to have its own receiving inspection plan then it makes sense to include the item number in the collection plan name. Also, by his experience Dave knows that clients almost always ask the same question – Can a collection plan have versions? The answer is – No. But, a simple workaround is to include the version number in the plan name. Dave had defined these collection elements in an earlier section. Dave adds these collection elements into the Inspection Plan for LH101. When adding collection elements into a collection plan, the Seq field determines in what order the collection element columns will appear in the Quality Results entry screen. Because, these 3 collection elements will be measured in succession, Dave ensures that they have consecutive sequence numbers of 31, 32, and 33. When to Invoke the Collection Plan? 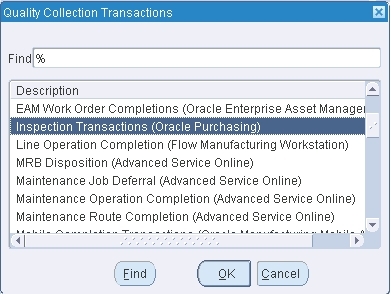 Oracle Quality needs to be told at what stage a collection plan should be called into action. There are two features embedded in the collection plan that help fix this “point-in-time” coordinate. Having selected the transaction, he must ensure that the Enabled checkbox is checked. If this is overlooked, then the collection plan will not be triggered during the receiving transaction. Also, collection plans such as this one, which are linked to receiving inspection are marked as Mandatory by Oracle Quality. For Receiving Inspection Plans, the Mandatory checkbox cannot be unchecked. The second and more specific way of pointing out as to when the collection plan will be triggered is to use the very same thing – triggers! The triggers that you can use with Oracle Quality come seeded or pre-defined. Dave wants this collection plan to be called every time the item LH101 is received. So, he defines the trigger as shown below. An Important Point:Associating a Transaction Type to a collection plan is mandatory if you want to invoke the collection plan during a specific transactional flow or business process. But triggers are optional. Quality data can also be entered into a collection plan in direct data entry mode. If a collection plan is created for direct data entry, then it need not be associated with any of the available transaction types. Dave has defined a specification for the item LH101 in an earlier section. 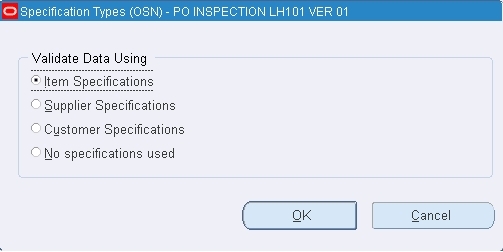 He now specifies that the system look for this specification when the PO INSPECTION LH101 VER 01 collection plan is to be used. Dave knows that in Receiving Inspection plans the pivotal collection element is the one called - Inspection Result. This is a seeded collection element that has two pre-defined values – Accept and Reject. Each of these values goes into a Rule. And to each of these Rules there is an Action assigned. The seeded Actions of Accept the shipment and Reject the shipment are used by the system to ensure that the items being received (in Purchasing) are marked as Accepted or Rejected, once the inspection is completed. This demonstrates the tight integration that Oracle Quality has with Oracle Purchasing. Dave uses this feature to create a rule wherein if the Hub Height measurement lies outside of the Specification Limits then the Inspection Result would flip to Reject. Dave applies the same rule to Hub Diameter. For the collection element Hub Finish, the values Dave had defined here, need to be imported into the collection plan PO INSPECTION LH101 VER 01. To do this, Dave positions the cursor on the Hub Finish collection element and clicks on the Values button. He gets the following message. Dave clicks on the Copy button. The values he had defined earlier for this collection element are imported into the collection element. The benefit of doing this for an Attribute type collection element is that when the user comes to this collection element column in the Quality Results Entry screen, he will find a list of values there. He need not type in the pre-defined values. Now, Dave is ready to present this collection plan to the Purchasing Inspection people.